I got the Mallard one year and the man next door had mounted it on a piece of plywood. I got a steam roller that ran off some kind of spirits. Wonder what they would’ve worth now? A doll and Pram..I still have and love dolls,but done with prams. lol. Got a HUGE remote control tank. It used to climb upstairs! Bikes, I loved getting bikes. Got a racer, then a few years later, a chopper. Brilliant. So all you got for Christmas was your "Two Front Teeth"
I remember getting a big yellow bulldozer (not Tonka) that puffed out 'real smoke'. it was either talc or heroin. Could be asbestos. Johnson and Johnson were sued for using asbestos in their talc. The one Christmas present I remember best of all was a Cowboy Outfit from my Great Uncle Jimmy (my Grandad’s brother) who had emigrated to the States. I was the original Rochdale, or is it Wiggin Cowboy!!!!!!! My Dad ( bit of a scuffy bloke) went into boots and asked for a bottle of meths, they said sorry " sorry mate its not good for you "
He said " you shower of assuming self righteous gits, its for my sons christmas present ,he's waiting at home for me to bring this bottle of meths to work his steam engine, The manager came out and apologized for his assumption and gave my dad the meths. my dad asked, " hey have you got a cool one ?" A two headed doll. One black head and one white head and 2 arms. It didn't have legs. I just turned the doll so the dress hid one head or the other. Strange doll but I loved it. I cant remember what happened to it. Have tried to find one over the years but never found one . I don't think they make them now Admin. They were very common in the past, in fact they have quite a history. Another version, although not as common, was where the head was made to twist around into a bonnet. One face being happy, and the other crying. This is about the most modern of a Topsy Turvey Doll. Thats the one. Well almost. I cant remember mine having a bonnet though. 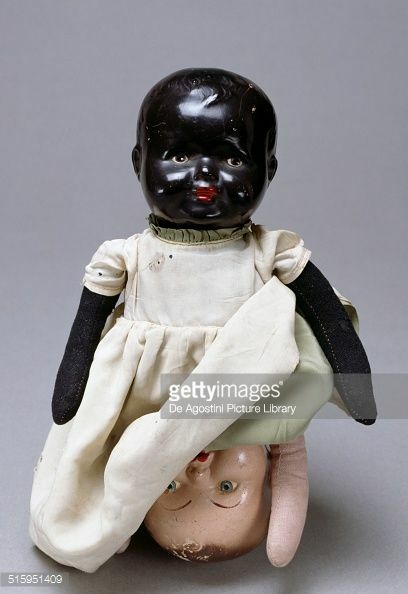 My Auntie bought me a black doll when I was about ten, went to the park with my Mam,put my doll down on the grass at side of me,turned round,it was gone, so bought myself one twenty years ago..I love it. @broady wrote: I got the Mallard one year and the man next door had mounted it on a piece of plywood. I got a steam roller that ran off some kind of spirits. Wonder what they would’ve worth now? i have what i think your talking about, its in a cupboard in the garage, it has everything, canopy, trailer. Can you take a pic of it and upload it to here, KPC? Long pants...No more welly slap marks...I thowt I was top mon. Hoping to get some this year too. There used to be some building set that you stuck thin pieces of wire in a base and the bricks were grooved to drop between them Could have been Bayko or similar!! !